Wash and cut potatoes into 1/8ths. Place on a cookie sheet that has been lined with foil (I used Reynolds Release foil so that they will not stick, but you could also either use non-stick cooking spray or lightly grease the top of the foil with extra virgin olive oil). Mix all of the spices and the parmesan cheese in a small bowl. Place all of the potatoes (remember we are talking about one pound at a time) into a gallon size freezer bag, add olive oil and the parmesan cheese/spice mixture to the bag. Seal the bag and shake until the potatoes are evenly coated. Once thoroughly coated dump onto the prepared cookie sheet and spread in a single layer. Bake 30-45 minutes or until tender and lightly golden brown. 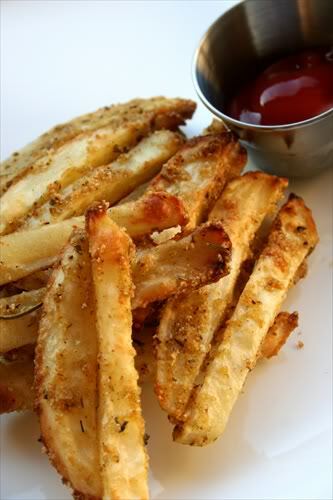 (Baking times will vary depending on the amount of fries that you make and the size that you cut them). For the ones shown in the picture they were baked at 425 for 45 minutes.